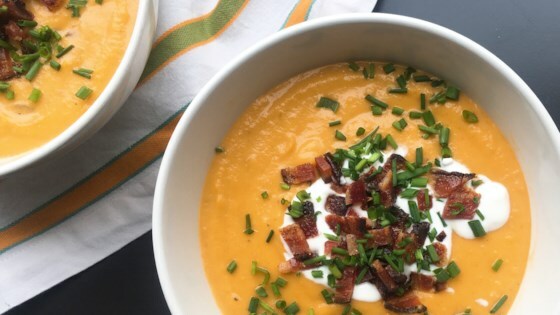 "I saw a potato-parsnip soup listed on a menu and thought it would be a combination that would work very well. I did some brainstorming and decided to roast the vegetables first, add smoked paprika for depth, and an assertive garnish. I'm happy with how it turned out and just love the color!" Preheat the oven to 425 degrees F (220 degrees C). Line a rimmed baking sheet with parchment paper. Spread potatoes, parsnips, onions, and garlic on the prepared baking sheet. Drizzle olive oil on top. Season with paprika, salt, and pepper. Toss until evenly coated and spread back out into an even layer. Roast in the preheated oven until browned in spots, about 40 minutes. Transfer roasted vegetables to a large pot. Cover with vegetable broth. Bring to a simmer; cook until vegetables are very soft, about 30 minutes. Remove from heat. Puree hot soup carefully with an immersion blender until smooth. Stir in half-and-half until thoroughly incorporated. Season with salt. Ladle soup into bowls. Garnish each bowl with dollops of creme fraiche, bacon pieces, and chives.